In stock 134 items in stock. This is the SparkFun ESP8266 Thing Dev Board --- a development board that has been solely designed around the ESP8266, with an integrated FTDI USB-to-Serial chip. The ESP8266 is a cost-effective and very capable WiFi-enabled microcontroller. Like any microcontroller, it can be programmed to blink LEDs, trigger relays, monitor sensors or automate coffee makers. With an integrated WiFi controller, the ESP8266 is a one-stop shop for almost any internet-connected project. To top it all off, the ESP8266 is incredibly easy to use; firmware can be developed in Arduino and uploaded over a simple serial interface. The ESP8266 Thing Development Board breaks out all of the module’s pins with pre-soldered headers, and the USB-to-serial converter means you don’t need any peripheral components to program the chip. Just plug in a USB cable, download the Arduino board definitions, and start IoT-ing. Why the name? We lovingly call it the “Thing” due to it being the perfect foundation for your Internet of Things (IoT) project. The Thing does everything from turning on an LED to posting data and can be programmed just like any microcontroller. You can even program the Thing through the Arduino IDE by installing the ESP8266 Arduino add-on. The ESP8266 Thing Development Board is a relatively simple board. The pins are broken out to two parallel, breadboard-compatible rows. The USB connector sits next to an optional power supply input, and an ON/OFF switch --- controlling power to the ESP8266 --- sits next to that. And LEDs toward the inside of the board indicate power, charge and status of the IC. The ESP8266’s maximum voltage is 3.6V, so the Thing has an onboard 3.3V regulator to deliver a safe, consistent voltage to the IC. That means the ESP8266’s I/O pins also run at 3.3V; you’ll need to level shift any 5V signals running into the IC. If your project requires a power source other than USB, the Thing Dev Board includes footprints for a 2-pin JST, 2-pin 3.5mm screw terminal, or a simple 0.1"-pitch 2-pin header. Unlike the original ESP8266 Thing, the ESP8266 Thing Dev Board does not have a built-in LiPo charger. The Thing Dev Board even includes a PCB trace antenna as a default WiFi antenna. It’s cost-effective and works really well! If you need to connect a more sensitive antenna, or need to route outside an enclosure, a U.FL connector is also available on the board. Some soldering will be required to get the U.FL connector functioning, but instructions can be found in the Hookup Guide we have written for the dev board. 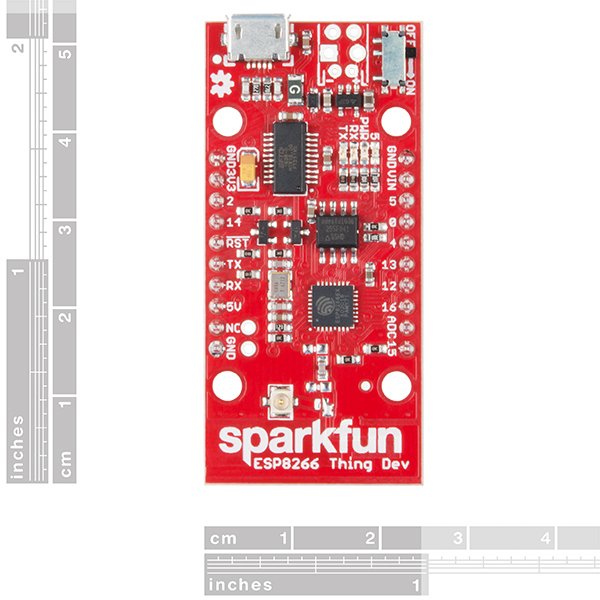 Note: We've provided a few Example Sketches to experiment with on your SparkFun ESP8266 Thing Development Board. These sketches can be found in the Hookup Guide in the Documents section below! 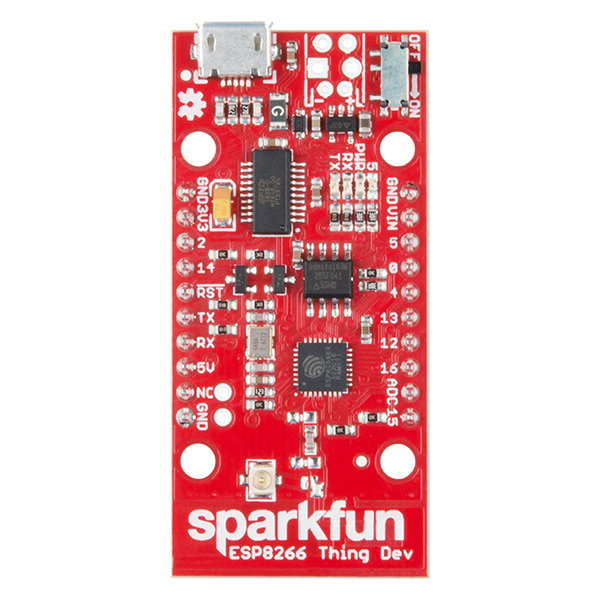 An overview of SparkFun's ESP8266 Thing Development Board - a development board for the Internet of Things. I'd like side-by-side list of the differences between the Thing Dev Board and the Thing. I didn't notice the Dev doesn't have a LiPo charger (yes, I see that lack is mentioned in the description). Is the following the complete list of differences? LiPo Charger: yes Thing / not Dev; FTDI interface: yes Dev / Not Thing; Pre-soldered headers: yes Dev / not Thing. It was no trouble to open the bag the Thing came in, download the Thing plugin for Arduino's IDE, program it via the Arduino IDE, and see it serving a "hello" message in my PC's web browser. The library is so much easier/better to use than the old AT command set interface to the ESP8266 - now I see why people love this chip. The flash size on the board was far too small. A blank Arduino sketch used up 52% of the flash. Because of the insufficient flash size I was unable to flash firmware over the air, which is important for the product I am developing. You can add a battery connector to use a lithium battery, but the board lacks the capability to charge a connected battery or easily check the state of charge. The reset switch is very cumbersome and a button would have been much more appropriate, because of how often I had to hard reset the esp8266. This board is good for tinkering but not at all appropriate for creating IoT products with potential end users. Was the perfect board for me to jump from the functionality of the "bare" WiFi module (https://www.sparkfun.com/products/13678) to the full capability of the ESP8266 with all GPIO available. Good little board. Works well for its intended project. LOTS of reviews, comments for "this"
Don't be fooled! 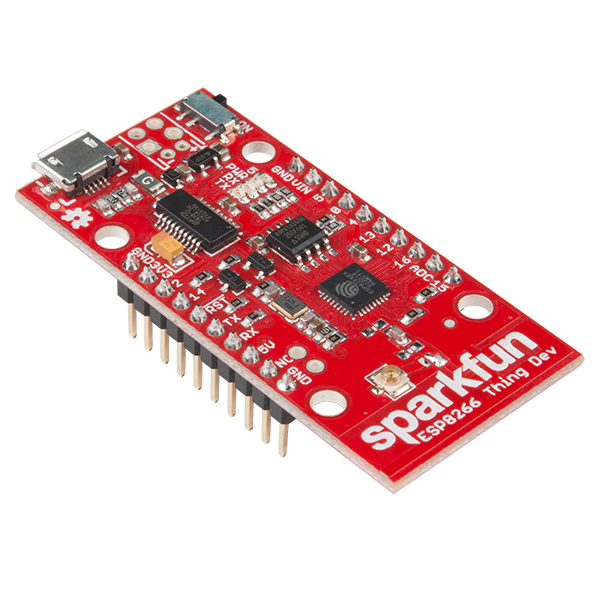 There are LOTS of comments and reviews for "this" device... if you head over to https://www.sparkfun.com/products/13711 which is THIS, but without the headers! Out of 69 reviews, 30 were 4 star, 28 were 5 star, 09 Mar 19. I love the device. Yes, you can get ESP8266s with more memory... but I run a webserver reporting sensor readings out of one of these. What do you want more memory for?? And yes, you can buy 8266s more cheaply. But do you get a RELIABLE 8266? With these features? With extensive documentation EXACTLY right for THIS variant? And easy, reliable dispatch of things you order, without silly p&p charges? Etc. Let's say you buy one for a third of the price of this. How much hassle is more hassle than saving $10 is worth?? That software is "stable"... I haven't had to tweak it since January 2017. .. to see what the webserver is reporting right now. It will tell you two temperatures, the count reached by two counters inside the ESP8266 (they count... independently of any software... the pulses seen on two inputs) and the state of a digital input. Oh. And you can turn an LED on the ESP8266 on or off. Most of that comes from other software, but the second graph, the one with "FW004" in the legend at upper left, comes, ultimately, from one of these devices, from a Sparkfun ESP8266.